At least one protester was shot and killed by Iranian security forces over the weekend, but that does not appear to have quelled opposition to the Iranian ruling regime, which was smacked Monday with the first portion of harsh new sanctions by the Trump administration following the president's decision to abandon the landmark nuclear deal that provided Iran's leaders with millions in cash windfalls. The ongoing protests have been percolating for weeks as dissidents take to the streets across Iran to protest the hardline ruling regime and its massive military spending, which has crippled an already weak Iranian economy. Western pressure on the Iranian financial sector heightened on Monday, as the Trump administration imposed the first wave of new sanctions on Iran's gold, coal, steel, and aluminum trade. The sanctions are being supported by new efforts by the Trump administration to warn European countries that any new business with Iran will subject them and their international banking systems to harsh new sanctions, as the Washington Free Beacon first reported on Thursday after conversations with multiple senior U.S. officials. Video that emerged on social media on Sunday shows a reported 6,000 bus drivers in Tehran, Iran's capital city, sitting in long lines for nearly 24 hours to get fuel, which has been cut off due to Iran's inability to pay its debts, according to translations of the Farsi language videos posted to Twitter. "Eighteen hours of work and this is the status of our city," a videographer can be heard narrating, according to an independent translation. "We have to wait in line 24 hours to pump fuel. If [Iranian Supreme Leader Ali Khamenei] doesn't have enough money, how dare he support Palestine and [the Lebanese] Hezbollah? If he doesn't have money, how dare he provide for those people going to Arbaeen [ Shiite religious ceremony in Iraq marking the death of Prophet Mohammad's grandson, Imam Hossein]?" "How much more hardship and disgrace are we to endure?" the narrator continues. "Our revolution wasn't for these people to take advantage of us and be cruel to us. Who should I say it to? I'm not saying it to myself. We should gather and go say it. Our revolution wasn't to support Lebanon, Palestine, and that filthy [Hezbollah leader] Hassan Nasrallah." Dissident protesters appear to have been encouraged by recent remarks by the Trump administration, including the president and Secretary of State Mike Pompeo, supporting the right of those to demonstrate against the regime. However, it remains unclear just how far the White House will go to back these protesters as they seek to topple the hardline ruling regime. 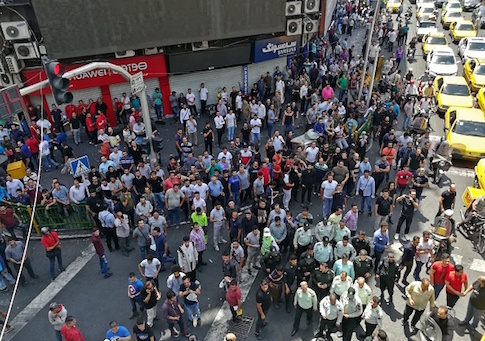 On Sunday, Iranian officials imposed a curfew around Tehran amid the ongoing, nightly demonstrations, according to those familiar with events on the ground. Much of the frustration has centered around the Iranian regime's continued spending on military interventionism, particularly in Syria on behalf of embattled President Bashar al-Assad. One protester, identified as Reza Otady, is said to have been shot dead during clashes with Iranian security forces and pro-regime militias. Other protests have raged in major Iranian cities, including Shiraz, Qom, and Mashhad, sources said. Social media sites such as Twitter have emerged as a prominent platform during the protests, which demonstrators coordinating their moves via these platforms. The main frustration continues to be Iran's economy, including the plunging value of the rial and the inability of citizens to purchase life staples.